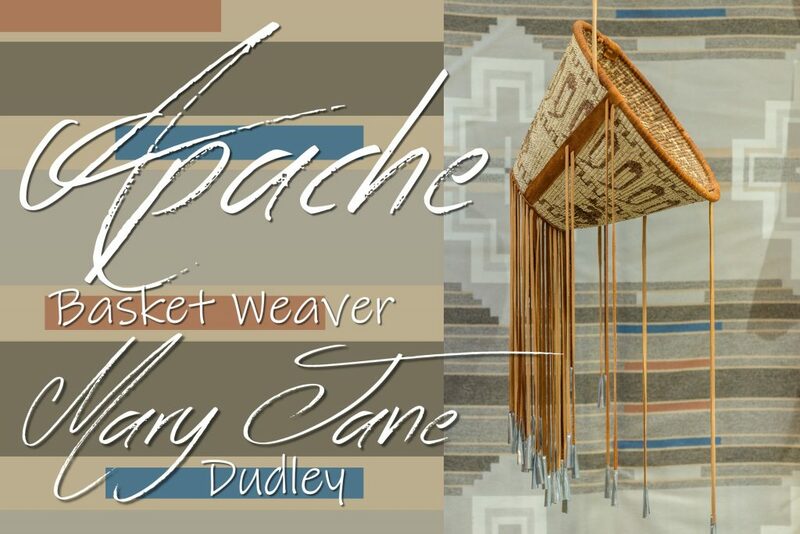 When seeing an Apache burden basket for the first time, we‘re not only struck by the unique quality of such an object, but by its beauty and practicality: the fresh, tangy scent of the willow strips combined with the pure, organic feel of the basket create a simple yet intriguing vessel. A ‘burden basket’ was for many years quite simply a device used to carry everyday items such as food and firewood. The wearer slung the basket on her back; a strap across the forehead used gravity to keep it in place. ‘Jingles’ at the end of buckskin strips were meant to frighten vermin (they’ve also been likened to the sound of rushing water). 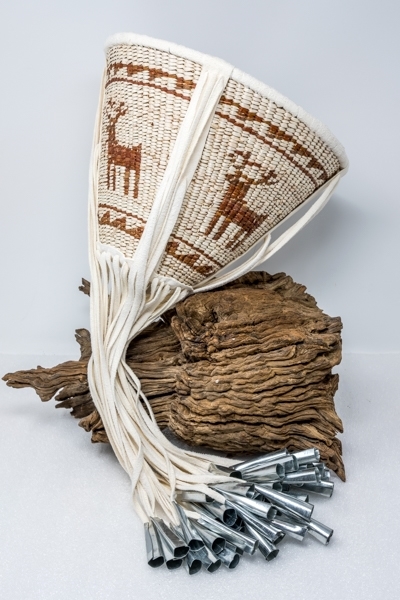 Baskets were utilitarian by nature, although specialized decoration by individual weavers created works of art which are sought after by collectors and museums the world over. The heyday of Apache burden basket weaving came to an end during the Great Depression. This was due to many factors: the availability of inexpensive pots and pans (which made baskets redundant for many uses) and the racist attitudes of white bureaucrats who thwarted the sharing of weaving techniques with Apache children by sending them off to government schools. 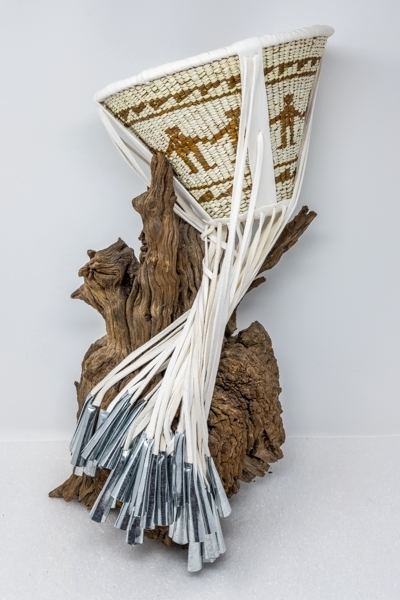 The art of Native American weaving has begun to blossom again, and talented weavers such as Mary Jane Dudley possess the commitment and patience needed to produce baskets which are sturdy, attractive and long lasting. “These are not wind chimes,” she says, laughing. Mary Jane Dudley of the San Carlos Apache Tribe in Arizona. San Carlos is located approximately 90 minutes east of Phoenix. Mary Jane Dudley’s Apache burden basket in a butterfly design. ‘Single stitch’ baskets are especially difficult– these are done with a 1X1 stitch as opposed to the more common 2X2, and it’s a much finer, tighter weave. Devil’s Claw (martynia) is blended with the willow for these striking, graphic baskets. The Devil’s Claw is soaked in hot water overnight, then split twice and woven. It’s an arduous process because the strips are so thin. Ms. Dudley’s ‘friendship design’ Apache burden basket, a personal favorite. 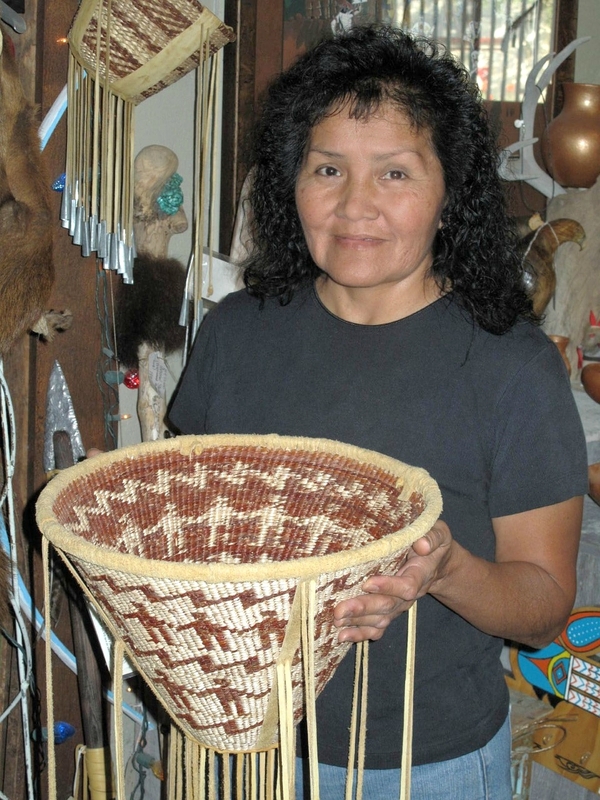 Mary Jane creates baskets on commission and she also sells to purveyors of Native American art, such as Globe, Arizona’s Pickle Barrel Trading Post. “We absolutely love her work– her attention to detail and the tightness of her weaving is incredible,” says Kelly Moss, who with her husband Jim has owned the Pickle Barrel since 2003. To Dudley, this is a far cry from that first basket she sold to Rupkey’s Trading Post in Peridot so many years ago. “I didn’t know how to sell a basket then,” she says. “I was really happy and appreciated what they did for me.” Today her biggest challenge is getting them done in time: Dudley is a very busy woman. Dudley’s favorite image to use in her art is that depicting Friendship– a circle of people holding hands. Her second favorite– which has a deeper meaning– is the Eagle and the Feather. Her sister Velda was the one to create this image. “I like doing this one,” she says, adding, “The Eagle represents strength and it reminds me to stay strong, and the Feather [represents] protection. It’s God who protects me all the time and I’ve always relied on God. My parents raised us up in a Christian home.” She goes on to clarify that while the Feather offers protection, it’s truly God who does that job because He is the one who helps us through hard times, and the one who has bestowed the ability and the knowledge to weave. Mary Jane Dudley’s impressive deer design burden basket. 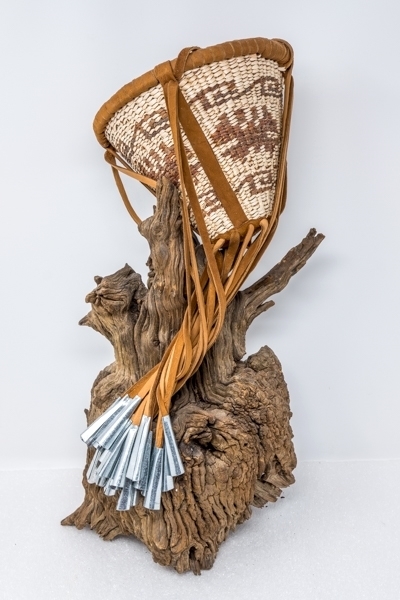 The work of Mary Jane Dudley can be seen at the Pickle Barrel Trading Post in Globe, Arizona, along with a fine selection of Southwestern turquoise and sterling silver jewelry, Native American art and pottery, home decor items, and so much more.